How I Flunked China's Driving Test ... Three Times : Parallels NPR's Frank Langfitt recently decided to apply for a driver's license in China. Since he already has a U.S. license, the main requirement was passing a computerized test on the rules of the road in China. He's been driving for decades, and figured it would be a breeze. He was wrong. Drivers step out of their vehicles for a better view while stuck in traffic along Beijing's Second Ring Road on a "Car Free Day" on Sept. 21, 2010. 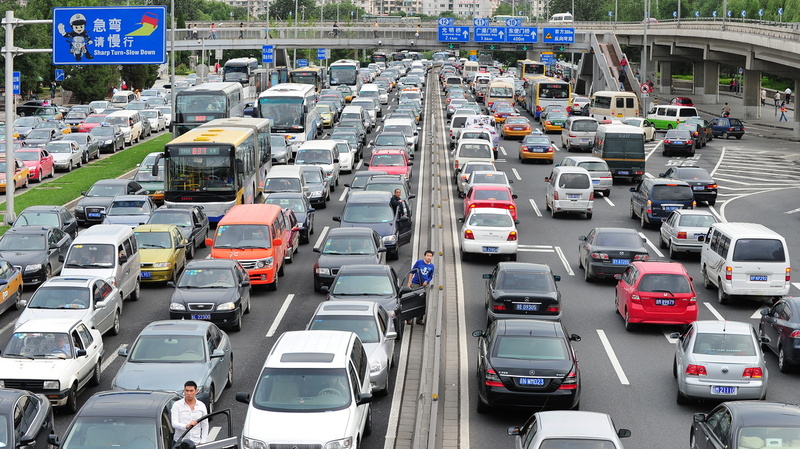 For foreigners trying to drive in car-crazy China, the headaches begin with the written test. Driving and car ownership have taken off in China. Last year, the country added nearly 18 million drivers. There is so much demand for licenses that I had to wait a month for the first available testing date. The night before my test, I decided to take a practice one online. There were 100 questions drawn from a pool of nearly 1,000. You had to get 90 correct to pass. I got a 65 and started to panic. On the way to the testing center the next day, I crammed on my iPad, but still only scored a 77. QUIZ: Do You Have What It Takes To Get A Chinese Driver's License? "If a motorized vehicle driver has caused a major traffic accident in violation of the traffic regulations which has caused human death due to his escaping, the driver is subject to a prison term of 3 years to 7 years." The answer, it turns out, is "no." I eventually answered this correctly, but still have no idea what the actual prison term is. "When theres [sic] a diversion traffic control on the expressway, a driver can stop by the side to wait instead of leaving out of the expressway, for continually running after the traffic control." I don't know what that means, but apparently under Chinese law, you can't do it. I wasn't the only foreigner who struggled with the questions. Others left the testing center shellshocked. "It's impossible to understand what they're trying to say," said Hugo Ulloa, an international trader from Chile, as we commiserated after he'd failed a second time. A man takes a computerized road rules test at a driving school in Jinan, in eastern China's Shandong province, in 2011. Most Chinese people — accustomed to an education system that emphasizes rote memorization — don't find the test as difficult as foreigners. "I've been studying for two days," Ulloa continued, shaking his head. "Last night, it was like three hours and I still cannot pass this. I'm getting really frustrated." Jeffrey Kelsch, an American who runs a market research firm in Shanghai, applied for a license last year because he wanted to be able to take his dog, Dash, a West Highland white terrier, on driving trips out of town. Kelsch took the English version of the test, but it didn't help much. After he flunked the first time, "I went out and complained," Kelsch recalled. "I said, 'There's something wrong with that test. I'm sure I got all of them right.' "
A traffic bureau official assured him he had not, but allowed him to take the test again on the spot. Kelsch, 46, failed again. Then he studied and took it a third and even a fourth time. "And I actually did worse," Kelsch said, laughing in disbelief. "So, at that point I decided, 'OK, I'm giving up on this.' "
Sometimes, Chinese people struggle with the test as well. When authorities added new questions early last year, failure rates initially soared. In the southern coastal city of Zhuhai, only 7 percent passed the new test, according to the Southern Metropolis Daily newspaper. In nearby Shenzhen, less than 4 percent passed. Once they study, though, many Chinese find the written test as straightforward as foreigners find it difficult. "For Chinese people, it's just another exam," says Wei Qi, a Chinese TV producer in Beijing, who aced the test on her first try. Wei says the format is easier for Chinese people, because they were raised in an education system that emphasizes memorization. That said, Wei doubts the written test produces better drivers. "Because the test is so complicated, it kind of undermines the purpose," she says. "I kind of forgot everything. If you asked a question now about a traffic rule, I still couldn't quite answer you." 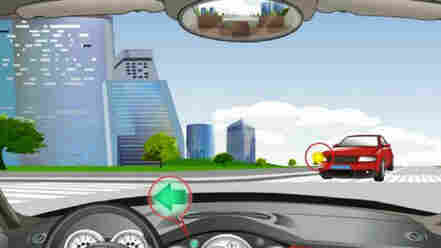 Wei thinks the behind-the-wheel driving test, which all Chinese must take and involves parking while avoiding laser motion detectors, is much harder. While most foreigners dread taking the written exam, Virgil Adams, a financial manager in coastal Jiangsu province, knew he would pass the first time. "I didn't study," he says. "I didn't do anything." He didn't have to, because he had hired a Chinese agent to fix the results. A man maneuvers a car during an electronic driving test at a driving school in Beijing in 2011. The road test for a Chinese driver's license requires the applicant to park while avoiding laser motion detectors. At the testing center, Adams sat down at the computer and went through the questions. After he finished, per his agent's instructions, he got up and walked out without submitting his answers. "My best guess is that probably my agent walked in, sat down at my seat, reviewed my answers and corrected any wrong ones," he says. Adams says the whole thing cost about $150. Paying people to take your driver's test is common in smaller cities here. 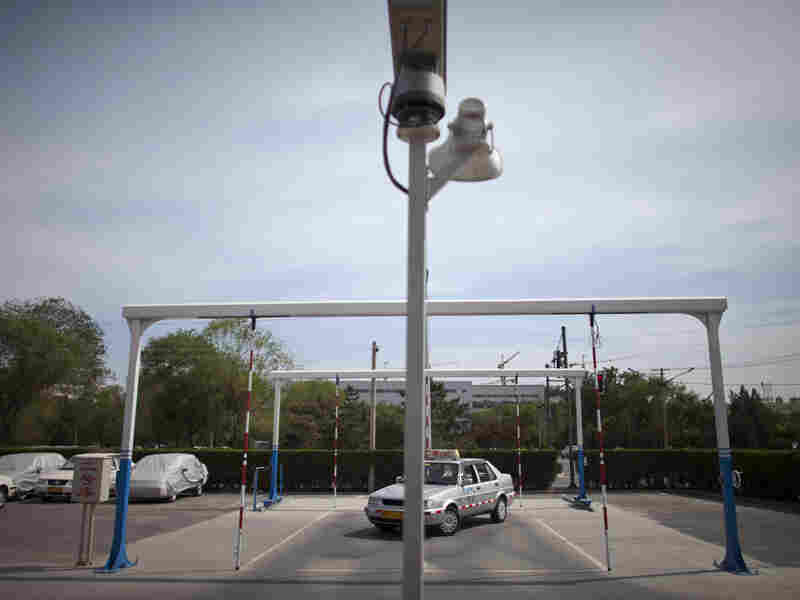 Authorities in Shanghai try to prevent it by putting cameras next to every computer. One of my Chinese friends got around that in western China, though, by aiming the camera at his face while a paid test-taker typed the correct answers on the computer just out of view. All that fraud may help explain why — as recently as 2011 — China had a nearly comparable number of drivers as the U.S., but almost twice as many traffic deaths. As for me, I continued to take the test — and fail. After I flunked the third time, without improving my score, I banged my head on the desk in the exam room and couldn't stop laughing. The police officer proctoring the exam shook his head and scowled, suggesting I should take my serial failure more seriously. On my fourth try after hours of study, I finally passed with a score of 93. Afterward, that same cop, with whom I'd become quite familiar, gave me a big grin and shook my hand.